Dumore Grinding Wheels for Tool Post Grinders are available in four different types for grinding the various materials encountered in the majority of grinding applications. 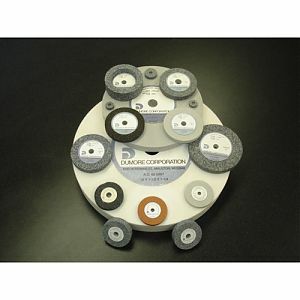 Unless otherwise noted Dumore grinding wheels are made of Aluminum Oxide. Note: 774-0010, 774-0023, 774-0045 and 774-0180 are combo wheels. One side is General Purpose, the other side is for stainless steels and steels of Rockwell C-45 to C-59. Note: 774-0167 is a combo wheel with one side 80 grit, the other is 220 grit. • General-Purpose, for steels of hardness up to Rockwell C-45 . 3/4"dia. x 1/2" x .250"
1"dia x 1/4" x .250"
3"dia. x 3/8" x .375"
Author: ??????? ??? ??? ?? ?